Photographers rely on precision lenses to generate well-focused and crystal-clear images. These high-quality optics—readily available and produced in huge quantities—are often taken for granted. But as scientists explore the details of materials spanning just billionths of a meter, engineering the nanoscale equivalent of a camera lens becomes notoriously difficult. Instead of working with polished glass, physicists must use ingenious tricks, including shooting concentrated beams of x-rays directly into materials. These samples then act as light-bending lenses, and the x-ray deflections can be used to deduce the material's nanostructures. Unfortunately, the multilayered internal structures of real materials bend light in extremely complex and unexpected ways. When scientists grapple with this kind of warped imagery, they use elaborate computer calculations to correct for the optical obstacles found on the nanoscale and create detailed visual models. 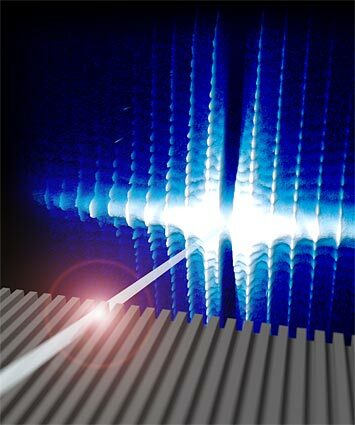 Now, owing to a happy accident and subsequent insight, researchers at the US Department of Energy's (DOE) Brookhaven National Laboratory have developed a new and strikingly simple x-ray scattering technique—detailed in their paper in the Journal of Applied Crystallography — to help draw nanomaterials ranging from catalysts to proteins into greater focus. "During an experiment, we noticed that one of the samples was misaligned," said physicist Kevin Yager, a coauthor on the new study. 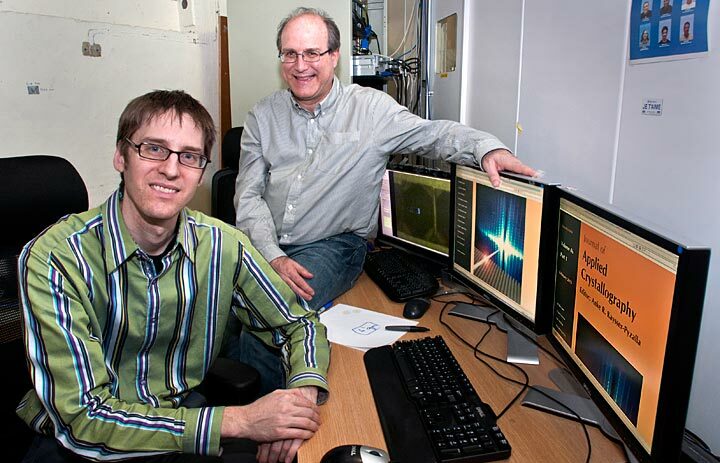 "Our x-ray beam was hitting the edge, not the center as is typically desired. But when we saw how clean and undistorted the data was, we immediately realized that this could be a huge advantage in measuring nanostructures." This serendipitous discovery at Brookhaven's National Synchrotron Light Source (NSLS) led to the development of a breakthrough imaging technique called Grazing-Transmission Small Angle X-ray Scattering (GTSAXS). The new method requires considerably less correction and a much simpler analysis, resulting in superior images with profound implications for future advances in materials science. "Conventional scattering produces images that are 'distorted'—the data you want is there, but it's stretched, compressed, and multiply scattered in complicated ways as the x-rays enter and exit the sample," said physicist and coauthor Ben Ocko. "Our insight was that undistorted scattering rays were emitted inside the sample—but they usually get absorbed as they travel through the substrate. By moving the sample and beam near the edge of the substrate, we allow this undistorted scattering to escape and reach the detector." The Brookhaven Lab collaboration was not the first group to encounter the diffraction that occurs along a material's edge, but it was the first to reconsider and harness the unexpected error. This rendering shows the high-intensity x-ray beam striking and then traveling through the gray sample material. In this new technique, the x-ray scattering—the blue and white ripples—is considerably less distorted than in other methods, producing superior images with less complex analysis [Image Courtesy: Brookhaven National Laboratory]. 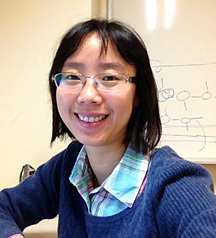 "Until now, no one bothered to dig into the details, and figure out how to use it as a measurement technique, rather than as a misalignment to be corrected," added Xinhui Lu, the lead author of the study. GTSAXS, like other scattering techniques, offers a complement to other imaging processes because it can measure the average structure throughout a sample, rather than just pinpointing selected areas. Scattering also offers an ideal method for the real-time studies of nanoscale changes and reactions such as the propagation of water through soft nanomaterials. "This technique is broadly applicable to any nanostructure sitting on a flat substrate," said study coauthor Chuck Black. "Lithographic patterns, catalytic nanoparticles, self-assembled polymers, etc.—they can all be studied. This technique should be particularly powerful for very thin films with complicated three-dimensional structures, which to date have been difficult to study." Brookhaven's NSLS supplies the intense x-ray beams essential to this technique, which requires extremely short wavelengths to interact with nanoscale materials. At NSLS, accelerated electrons emit these high-energy photons, which are then channeled down a beamline and focused to precisely strike the target material. When the next generation light source, NSLS-II, opens in 2014, GTSAXS will offer even greater experimental potential. "We look forward to implementing this technique at NSLS-II," Yager said, with Ocko adding: "The excellent beam focusing should enable us to probe the near-edge region more effectively, making GTSAXS even more robust." Xinhui Lu, Kevin G. Yager, Danvers Johnston, Charles T. Black and Benjamin M. Ocko, "Grazing-incidence transmission X-ray scattering: surface scattering in the Born approximation", Journal of Applied Crystallography, 46, 165-172 (2013). Abstract.